Easier said than done, right? Each day offers new challenges and struggles to find and keep joy alive in your household. It’s something I’m continually challenged with being a wife and mother and why I’m so excited for the release of The Lifegiving Home: Creating a Place of Belongs and Becoming by Sally and Sarah Clarkson. A mother and daughter writing team, Sally and Sarah share their story and advice how to make your home more than 4 walls and a roof … a haven of warmth, rest, and joy … the one place where you and your family can’t wait to be. Every day of your family’s life can be as special and important to you as it already is to God. Give foundations of strength and inspiration to these precious ones, but give them wings as well. Prepare them to take risks, to live by faith, so that they can take the messages and cherished values they learned at home and share them with a hurting world. And so our home became a launching pad, a place of blessing, as we sent our beloved children on their way—hopefully strong, whole, and secure in the ideals, faith, and values that truly matter. What makes The Lifegiving Home so unique is how Sally and Sarah walk through each month of the year and share specific ways you can celebrate togetherness and create special memories for your children. For February, Sally focuses on giving love. 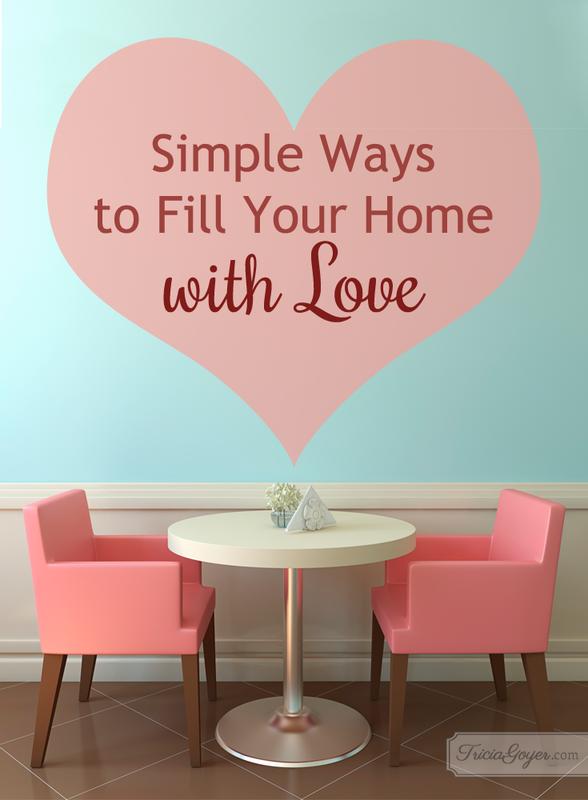 From handmade Valentine’s cards to homemade treats to hand-picked flowers, look for extra-special ways to pour love on those in your household. Have everyone write down one thing you do that makes them feel extra-special. Then do it! Use the concordance in your Bible to look up verses about God’s love. Read a verse or two each day before dinner. What ways will you foster a loving home this month? Share your ideas below and make sure to enter to win a copy of The Lifegiving Home below! We have this game night we try to have every time we get together. For my immediate family, we have a movie/tv series night and we make popcorn or some kind of snack (can’t be healthy!) and just enjoy our time together. I fill My house by Playing Board Games, Reading to each other and every weekend one of us makes a special meal for everyone! We love board games, too! I make a special dinner and dessert for my family every year on Valentine’s Day! Im showing my love to my family by praying for each of them, and doing what I can to bring peace and harmony in my home by my attitude, showing love by the way I act and respond to my family and love unconditonally. Our attitudes make all the difference! I can show love to my family by making their favorite meals, praying for them and showing them unconditional love. I can show love to my family this month by practicing self-control when I am upset or angry, by choosing to be a positive member of the family instead of negative, and to love and pray for my family members. This is something we all need to strive to do! I do special little things like bring my husband his coffee every morning, make sure my kids have different foods they like stocked up, and keep things cozy and clean even when I don’t feel like it. I love them so much and they are worth the effort! Simply telling them that I love them! I plan to surprise the kids with a box of chocolates each on Valentines Day. February in Colorado requires some special effort to keep the house full of love when we are feeling more cooped up than usual. My commitment is to be focused on making something beautiful of our family meal times, praying over each individual on a daily basis, and really attending to keeping our home at peace. That is sometimes much easier said than done but I know with prayer and courage it can be our cultivated reality. Thank you for your encouragement, Tricia! I LOVE the idea of praying over each individual person on a daily basis! I can love my family by being fully “there” when they want to talk when I really want to go to bed! Teens seem to open up at night! Bedtime stories and prayers . . . continuing on all the way till they’re out of our home. By loving them with a good attitude and really looking forward to this book! I will foster love in my home this month by finding small moments to be fully present with each child individually, hug more, and cultivate an atmosphere of love and laughter. I will surprise them with a dessert/treat and spend more time with them. I will do something for my husband- just the two of us- to foster love and re-connection with him. I will show love to my beautiful family this month by trying to be more present, listen with my heart and ears and eyes, read lots of books together, and by playing their favorite games more often! Thank you for the encouragement! I am planning for Valentine’s Day to cut out red hearts and write love is…..on them and place them in different everyday places in our home to show my family all the ways I see love in our everyday. I will show love by thinking before I speak. Lately it seems more negative than positive reinforcement has been coming out of my mouth….and I then see it mirrored in my children to one another. We do movie nights and Sunday night meetings over dinner…but i’m seeing that that alone means nothing if my words do not match what we want for them. I love the practical ideas! I plan on making surprise Valentine’s Day cards for my two girls (age 6 & 8). Acts of service and words of affirmation are two of their strongest loves languages. I also plan on doing a lot of baking (I love using baking to teach math!) to give out to neighbor’s. Our girls also soak up individual dates with us to that is a must this month! We’re making Valentines for our family and preparing some snowman pizzas. We also love reading to one another and will be finding verses about love and how we can share that with others around us. We are packing up to make another big move so finding the time to spend a few moments with each daughter to really see how she’s doing in the transition will be the heart of our family this month. We try to spend as much time as we can doing things together. Heidi, it’s amazing how when we cheer up they often do, too! So many great ideas! I will pray for God to help me see each family member through His eyes, and to show me what things I can do that would be most meaningful to each of them. Yes! Each person is blessed in unique ways. Beautiful! My children are 4 and 2, so we do a lot of reading aloud. I’ve recently started reading chapter books at bedtime, and looking forward to the continued storyline has been fun for all of us. We also enjoy doing crafts together, especially when we can make something for Daddy. I love reading books at bedtime! When my children were younger we always had a special treasure hunt planned for them on Valentine’s Day! Now that they are older I need to be more creative! This week I plan to create a mystery meal. Fly halfway around the world to hug, listen, savor. We celebrate Valentines Day by dressing up and enjoying a special family meal together. We also let our children pick out a gift for one of their siblings. They always look forward to it. I homeschool my 4 boys and this month I am trying to be intentional about spending time with each of them, one on one, doing something of their choosing during our school day. It is so easy to get “too busy”! To be kind and spoil them with little valentine treats and cards. I’ll also be writing them each a handwritten note on how much I love them and how much they mean to me. Oh, I love the idea of handwritten notes! I like to make their favorite foods, and on Valentines Day I make heart shaped foods like egg-in-a-hole, pancakes, pizza, etc. for meals and give them candies/snacks with corny love messages. By controlling my anger around them, and doing things for them just because. I will show love to my boys this month by baking with them, an activity that they enjoy participating in that we do not normally take time for. My kids love baking, too! Great article! I show love to my family by leaving encouraging notes for them and praying for them. I have 2 teens in my house and we really enjoy spending time altogether and talking. I’m sending little notes about things I love to do with or about my son in his lunch every day this month. He’s loving it! One way for me to show love to my family is by spending one-on-one time with each of them. Growing up in a large family, I sometimes felt lost in the crowd (always loved, but sometimes overlooked), so I want to be intentional about spending individual, undistracted time with each child (and my husband, too!) every so often. I think slowing down and giving my girls and my husband my undivided attention is something I can do to show them love. I also want to start scheduling dates with each of them to be intentional about listening and being present in their lives. We do dates with our kids and enjoy them! I can love on my family by not yelling at them and putting my full trust in God and teaching them to do the same. I would love my family by not being on the computer when they are home so I can be more intentional about giving them my full attention. One way that I work to foster a loving home has more to do with what I say than what I do. I foster a loving home by working really hard to speak lovingly to my husband and son. One aspect of my vision for our home is that it would be a sanctuary where they feel welcomed, relaxed, and recharged. They’re not going to feel that way if I’m always nagging, yelling, or critical. I certainly do not always get this right!! But it’s something that I am intentional about. In the month of February my husband and I use post-it notes to love on our kids. Every night we write a praise, prayer, or note of encouragement on red or pink post-its and stick them to their bedroom doors. We started this tradition 2 years ago and have continued it because I noticed that the kids had saved all of their hearts. (I find them everywhere when I help them clean their rooms.) When you think about it, who doesn’t like to be reminded that they are loved? I am going to travel to see my grandchildren at the end of the month. We always enjoy seeing each other on visits since we live far apart and dont get to see each other every day.